All applicants to the Frost School of Music must audition and some are required to submit prescreen videos. See below for additional details. On-campus auditions are preferred and provide a full day of activities for students and parents. In addition to the audition with the faculty, you’ll have many opportunities to meet Frost School students. Audition days begin with an information session including presentations from the Frost School of Music Office of Admission, Frost School of Music Undergraduate Dean, University Office of Admission, and University Office of Financial Assistance Services. Some instruments/genres may require a prescreening prior to being invited to audition. Contemporary applicants must complete a live audition on-campus or at the Los Angeles site. 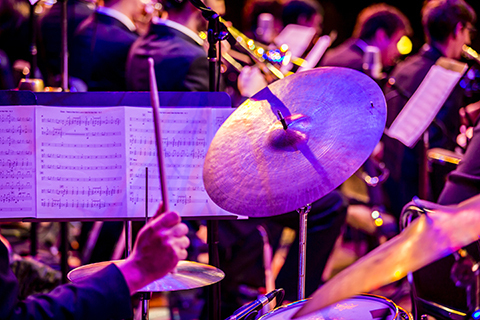 Jazz applicants must complete a live audition on-campus. In rare circumstances, a recorded/Skype audition may be approved by the faculty. Please check the requirements for your specific instrument by using the clickable links on the left-hand menu. Applicants select their preferred audition date on the SlideRoom application. Auditions are scheduled in the order that completed Frost School of Music applications and fees are received and there is a $25 fee to change an already confirmed audition date. Prescreening requirements are not the same as portfolio requirements for Composition, Media Writing & Production, and Music Engineering Technology. See below for additional details on portfolios. If you are unable to attend an on-campus audition, regional auditions are an alternative for some instruments: we will not hear classical percussion, jazz (with the exception of jazz voice), contemporary/jazz drumset or contemporary media at any regional site. Contemporary instrumentalist/vocalists and jazz voice may audition at the Los Angeles site. Other sites may have limitations and are noted below. Priority deadline is November 1st for Early Action and December 1st for Regular Decision. Recorded auditions must include both audio and video. Upload online through SlideRoom at the time of application. Accepted for classical applicants living north of Orlando, Florida. All other applicants must audition live on-campus or in some cases as a regional site. We may accept the same video submitted as a prescreen as the recorded audition, but restrictions apply by genre/instrument. We will notify you if additional material is needed or if an audition has been approved and scheduled for you to visit campus. Check the requirements for your specific instrument by using the clickable links on the left-hand menu.